Welcome to the FINAL appliance reveal for the new kitchen! I know, I know, you are all thinking...they have put every appliance known to MAN in that kitchen, what could be left? And I'm here to say that 1) no, shockingly we did avoid some of the appliance options available to us, including a built in deep fryer, indoor grill, and teppanyaki griddle, to name but a few. And B) the one thing left was the one thing your Polymath wanted like it was her job. I won't bang the travel gong too much more, but I will say that one of our favorite things about visiting other places is visiting markets. Open air markets, enclosed marketplaces, watching the locals buy ingredients, haggle over prices, kibitz and joke and share the news of the day with the vendors is always a treat for us. Exploring the delicacies, usually wishing we had access to a kitchen, and always picking up some of the prepared foods to eat on the go. And pretty much everywhere we go? 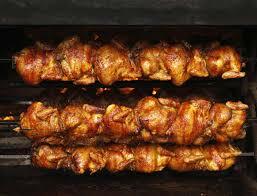 We are instinctively drawn to the rotisseries. Usually large versions on trucks, laden with chickens, rolled sausages, pork roasts. The good ones? Have small new potatoes cooking in the meat drippings in a trough on the bottom. You order your protein of choice and you get a hefty portion of the crispy fatty potatoes with your selection on top. All you need is a stack of napkins, your handy pocketknife slash wine opener, and a park bench and you will feast like a king. There is something about meat on a spit that just hits us where we live in a primal way. And while we love pretty much any hunk of animal that has been spinning in its own juices for a period of time, the thing we dream of? Yep, the perfect roasted bird is like our holy grail. A good one is great, and a great one is transcendent. Even a mediocre one from the grocery store still makes for a satisfying weeknight dinner. 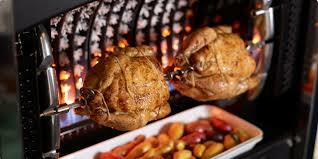 Sure, an oven does a fine roasting job, but roasted chicken is different than rotisserie chicken. Rotisserie chicken gets a skin that is both extra crisp and slightly sticky, naturally glazed in its own juices. The meat is beyond moist, the seasoning manages to make it all the way through even without brining or marinating. The fat renders out (making those amazing potatoes) but keeps the chicken constantly basted, so even the breast meat is succulent and perfect, and won't even dry out on a quick reheat for lunch the next day. It is better cold than some chickens are hot. We have at least one a week. 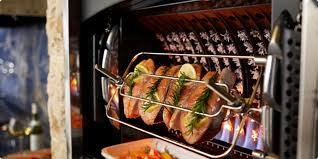 Since we both love it so much, and it actually is healthy for us, we have the rotisserie attachment for the Weber grill for outdoor cookery, and Charming Suitor supported my acquisition of not one, but TWO ancient Roto-Broil 400 machines from the mid 1950s for inside jobs. If you really want to know why in a meaningful way, read THIS ARTICLE by Mark Bittman. 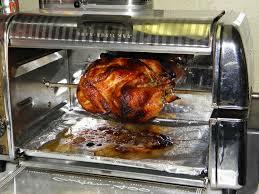 The short of it is, these machines quite simply make amazing rotisserie chicken. And provided you don't get third degree burns from how hot the outside of the unit gets (likely why they were discontinued), you can get some terrific meals out of them. 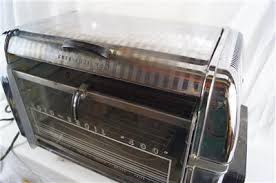 But there is a small problem with the Roto-Broils. Chickens were different in the 1950s, smaller. So while these things will rotisserie the heck out of one small 2-3 lb chicken, or two cornish hens, you cannot fit two chickens in it, nor a larger roaster. So perfect for just me and CS, but not so great for dinner parties. And while you can par cook potatoes and put them under the chicken, they just sort of get greasy, and not crispy, because the heat element is on the top. When we did our original list of the must haves, nice to haves, and splurges for the kitchen, the last thing I put on the bottom of the list? A La Cornue Flamberge Rotisserie. 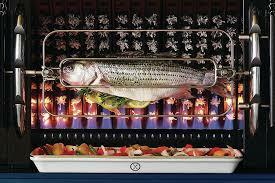 I know I don't have to explain La Cornue to any of you, the brand has been the dream of cooks for over 100 years. If we had an unlimited budget, we'd have gotten one of their amazing stoves, however, they cost more than a fully loaded BMW, although the mileage is much better. 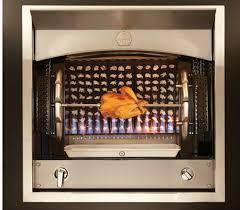 But they make the only home rotisserie on the market, and boy are they amazing. 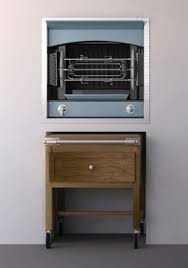 These built-in units are the size of a small oven, and are gas controlled. A wall of wicks on the back of the unit flames to life, and the generous capacity can accommodate up to four chickens at once! 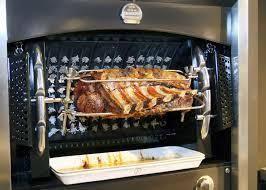 It can also do a leg of lamb, or a porchetta roast or a turkey or prime rib or several fish...it is glorious. Are you starting to feel me? Think about a whole pork belly, cooking low and slow all day to juicy perfection. Or even a couple of whole pineapples, getting caramelized on the outside, to be sliced and served with thick vanilla Greek yogurt and some toasted almonds for a healthy but still decadent feeling dessert? Yeah. From the moment I saw this baby it was deep down in my heart in a serious way. This is when it is a really nice thing to turn 45 in the middle of a kitchen renovation, because when your amazing hubby asks you if you would like to add in the rotisserie as your birthday present? You say yes really fast! I cannot tell you how excited we are to start using this baby! From a design perspective, we are giving it it's own tower of glory, next to one of the ovens, clad in the same Dekton material as the countertops. Many of the installations we saw while researching, showed a slide-in butcher block of some sort below the unit. We loved the potential functionality of a setup like this, and especially loved that it would give us a use for the vintage butcher block we have in our current kitchen. The rotisserie tower will have a nook like the one above, and we are adding casters and a handle to our butcher block, and it will slide in and out of the way, but be right there when it is time for carving! They will tell you that they take 14 weeks to build, since they are all custom. And by 14 weeks they mean 26 weeks because, you know, France, and also, math is hard. They put out some serious heat, since there are no doors on the front of the unit, so you need a 5 foot clearance in front of it with nothing flammable. I would say definitively that if you have small children? Wait till they leave for college before installing, there are no child locks on the controls, and when you turn it on you create a wall of open flame that could spell disaster without adult supervision. You will also want to be sure there is plenty of good ventilation in the room, or you will need an extra venting system. Ours is in a location that is pretty open, and is right next to the door to the back porch, and on the same wall as our massive powerful hood, so we didn't need to do special venting for it, but you will want to err on the side of caution. Stay tuned for some upcoming installation posts on all of the appliances, things are really heating up, pun intended, and we may be getting close to some glamor shots in the next couple of weeks! What would be the one thing that would be your fantasy splurge item in your dream kitchen? Congrats, "fgirl" you have won the big Valentine's giveaway! Please send your shipping address to me at staceyballisinfo (at) gmail (dot) com and I will get the team on sending all of your prizes! In the meantime, stay tuned, this week there are some big house updates coming! Before I go rogue over here, I just want to remind you all that it is not too late to enter to win the huge Valentine's Day Giveaway! Just CLICK HERE and comment to win on the post. Entries still possible till 11:59PM CST Friday Feb. 19! Okay, so today I'm chatting about something a bit different. This is not a travel blog. And while Charming Suitor and I love to wander the world together, our travel adventures are just not something that I write about. We don't publicize our trips on social media, we only really tell close friends and family when we are going to be away, it is just one of those things we protect for ourselves. As such, you'll notice that while I might recommend a cool piece of travel gear or equipment on this blog, you don't really see me touting places to go or things to do. There are many many terrific travel blogs out there, and it just has never seemed cogent to this space to write about tourism stuff. Which is usually fine, except every now and again you have an experience so wonderful, and so unexpected, that you want to give a little shout-out. I rely so much on people who enjoy my books to tell their social media circles about them, even if they don't have a "book blog", so when CS and I had a surprising and fantastic experience on a trip recently, I decided that this time, it was worth taking a moment to acknowledge it publicly. CS travels a tremendous amount for work. Sometimes this is domestic, but lately a lot of it has been to Europe. And since my job is eminently portable, and my boss is super nice about giving me freedom to roam, occasionally I get to burn some frequent flier miles and accompany him! Recently he had a meeting scheduled in Amsterdam. This is a city neither of us had ever been to. So it seemed like it would be fun to test it out for a few days, to see if it should be on our list of places to come back to and explore more in depth. To be honest, our expectations weren't exactly sky high. We knew there were some great museums we wanted to see, and that it would be very cool to check out a city built on canals. But as neither of us are interested in cannibis in any meaningful way, ditto legal hookers in windows, we sort of figured it might be a "one and done" city for us. And that? Could not be further from the truth. And a big part of that has to do with two businesses that I want to tell you about. First off, I can say unequivocally, GO TO AMSTERDAM. It is a super fun little city, chock full of wonderful cultural experiences, and quite simply the nicest people we have ever met. Seriously the Dutch? Amazing. Sweet, funny, easy going, helpful, fantastic people. The food is varied and extraordinary. The little shopping boutiques have really cool stuff, the architecture is like nothing either of us had ever seen before. The three days we had there were not nearly enough, and we will definitely be going back. And when we do, we are staying at The Hoxton again. We got the recommendation for this sweet little boutique hotel from a friend who used to live in Amsterdam. It is right in the middle of an area called the 9 Streets, which is essentially SoHo. 9 streets full of adorable boutiques and shops and fantastic cafes and restaurants, you can wander this area for a full day and never get bored or hungry. And from the moment we checked in, they took such good care of us, with such clever amenities, we knew that this was a special place. Let me be clear. CS and I have stayed in a LOT of hotels over the years. There are some we love for location and function, and some we love for their romantic essence and luxury, and some we put up with because they are the best of what is available in our budget for where we are going. But The Hoxton? Made us fall in love a little bit. For starters, the staff is amazing. So helpful and accommodating, so genuine and warm, every one of them. The rooms are quirky and comfortable, with really great beds and linens, and some fun local products in the bathrooms. They give you a fridge in your room instead of a mini bar, and then at the front desk you can pick up anything you might want, handmade potato chips, local artisanal chocolates, wine and booze. As they said, why stock your fridge with a ton of stuff you probably don't want, when you could customize it for yourself. They have as much bottled water as you want or need for no charge. Heading out for the day? Stop at the desk and pick up a water to take with you, no problem. They have a quirky and fun sense of humor, so the do not disturb sign essentially says "Don't come in, I'm naked", and the little sticker on the extra toilet paper says "Wipe Away!". They have local graphic artists do custom maps for them of the area that they put in your room, with recommendations of places to visit and eat. Lotti's, the restaurant and bar in the lobby is clearly a place the locals love as much as guests, it is bustling and lively, with really terrific food. No boring lobby cafe this, this is just a great restaurant that happens to be in a hotel. It was fun to come back on Friday night to find the place full of vibrant people all eating and drinking and having a great time, it brings really nice energy to the place. And no, there was no special deal or anything, it was just a place that a friend recommended that was in the price point for CS's company, so it was like finding a magical unicorn. Thank you Hoxton Amsterdam for taking such good care of us, we will be back! The second business I want to give a shout-out to is Hungry Birds. Since we had so little time, we decided to do a half-day foodie tour of Amsterdam. I did some research online, and Hungry Birds seemed to be the perfect fit, four hours, tours limited in size, incorporates the big Albert Cuyp market that we had wanted to see anyway. And it was fantastic. Our guide, Ester-Hanna was fun and funny, and incorporated some history of Amsterdam into our tour. We had a terrific group of people, and explored all sorts of delicacies. They focus on small, family-run businesses, so every stop we met amazing proprietors who shared their personal stories with us, which made the food even more delicious. We tasted everything from Indonesian and Surinamese food, to old school Dutch specialties, to funky fast food! There was a custom organic yogurt bar that blew us away. (yeah, game changing yogurt, who'd have thunk THAT?!) Well balanced with sweet and savory, and even a couple of stops that included drink as well as eats, we spent a wonderful four hours and left feeling like we had a true sense of the food culture of Amsterdam, and a list of places to return to. Please take this moment to share in the comments a business or product that you just love and think the rest of us should know about! Hello, Chickens, and a very happy day to you all! I hope that you are spending the day in some sort of celebration. If you are attached, I hope you and your darling are indulging in romance aplenty, whatever that looks like for the two of you. And if you are single, I hope you are unapologetically celebrating your freedom, and toasting with like minded pals. Charming Suitor and I are, as it should surprise no one, pretty romantic on a day to day basis. I think we both know that finding each other in, let us acknowledge, the second act of our lives, so to speak, we are aware of both the time behind us that we missed not knowing each other, and the need to not waste a moment of the gift we've been given in each other. Romance means different things to different people, so I don't mean to imply that the way we do it is right or better, just that it works for us. There are the little things. Every night before bed we have small glasses of champagne, to toast the day, to toast our love, to send us to sleep with little tickly bubbles in our noses. It is the perfect nightcap, and a wonderful tradition. Gifting can be complicated with couples, but luckily for us we are pretty much on the same page. We believe in happy presents, those little random gifts, small things you find along your path that make you think of the other person and know it would make them happy. We don't wait for holidays or special occasions for these, we just find, and give. Because sometimes an unexpected treat on a Tuesday is just the thing. For the holiday season, we don't give to each other, we make donations to causes that are near and dear to loved ones hearts, and give each other the gift of time. We both take off the week between Christmas and New Years and spend it lazily at home together, indulging in naps and afternoon movies and complicated meals that we can cook together. No work, no "have tos", no projects, just us together is all we need and the best gift we could either of us ask for. While the Chateau is under construction, birthday and anniversary gifts tend to be of the practical household variety. Did you know that the Fourth year anniversary gift is appliances? Well, it was in this house! For those of you who know us, you know that both Charming Suitor and I are Francophiles. We have both been fortunate to spend a lot of time in France, both separately and together, and went there for our honeymoon. So ever since we bought our house, since it looks like a little castle, we've been calling it The Chateau. More specifically, Chateau de Pamplmousse. Pamplemousse is my favorite single word in French. It means grapefruit, which is one of my favorite flavors, but I think even if I didn’t like the flavor of grapefruit, I would still love the word. Just say it once, out loud. C’mon, no one is listening. Pamplemousse. Pronounced POM-PLA-MOOSE. Isn’t that fun? Don’t you want to say it again? I always thought if I ever had a restaurant I would name it Pamplemousse. Except your Polymath does not want to work that hard. Pamplemousse is also Charming Suitor’s favorite word in French, something we discovered early on in our courtship. He has spent years trying to get his friends to name their pets, and alternately children, Pamplemousse. He will occasionally look me in the eye and say “You had me at Pamplemousse.” which I am sure is making you throw up a little in your mouth right now, but it literally makes my heart melt every time. My license plate is PMPLMUS. So, in celebration of Valentine's Day, and the progress on the house, I thought I would do a special pamplemousse themed big giveaway for all of you! And I've got some wonderful partners on this one. First and foremost, as I have said before on this blog, It is important to know something about me. I think most sparkling flavored waters taste strongly of furniture polish. But I do like fizzy water, and have been avoiding pop for a while now, trying to stay away from artificial sweeteners as much as possible. 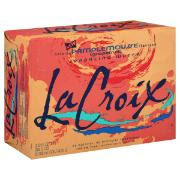 So when LaCroix came out with a grapefruit version of their flavored sparkling water a few years ago AND called it Pamplemousse, I had to try it. I don’t know if I love it as much as I do because I was psychologically pre-disposed to like it based on the name, but the fact is that we now drink about two to three cases of it a week since CS loves it too, as do some of my closest friends, so I believe it is really just tasty. Very lightly flavored, and oddly great with most food. No artificial colors or flavors or salt or sweetener, so it is good for my program. And the lovely folks at LaCroix have sent me some vouchers for free cases of their products to pass along to the lucky winner! You don't HAVE to use it for Pamplemousse flavor, but I do strongly recommend it. I also do eat quite a bit of grapefruit in season, but as you can imagine, once I needed to reduce my added sugar intake, I needed to do a bit of research to find the grapefruits that are sweet enough on their own so that I didn't miss that little sprinkle of sugar. Enter Wonderful Sweet Scarlett's, a new brand of Texas Red Grapefruit that I have become really fond of. I have to be honest, I never really looked for a specific brand of grapefruit before, and came across these because my local grocery store had them and they looked good. But when I tasted them, really sweet punchy grapefruit flavor with almost no acidity, I checked that little oval label and remembered it. 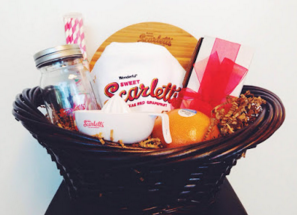 The folks at Wonderful Sweet Scarlett's have put together a terrific gift basket for you! This basket has some delicious Wonderful Sweet Scarletts grapefruit, a circular bamboo cutting board, an apron, a grapefruit spoon and grapefruit bowl, as well as a Valentine's heart shaped cookie cutter. And I've got some fun recipes below to use those grapefruits to their fullest, sweetest potential. Last but not least, we had some guest soaps custom made for the house in a delicate grapefruit scent, so I will be sending a personalized signed copy of Recipe for Disaster and a bar of the official Chateau de Pamplemousse soap to the winner as well. To enter to win, leave a comment below on your favorite way to celebrate (or not)Valentines Day by 11:59pm on February 19, and I will announce the winner on the 20th! Place all of the peels in a Ziploc bag with the sugar and press out the air. Mush around to begin to release the oils. Let sit at room temp at least 6 hours to overnight dissolve the sugar, smushing it around occasionally, then strain into a bottle for use. Mix the gin, aperol, white vermouth and oleo saccharum in a mixing glass over ice, and stir to combine. Strain into a rocks glass with ice cubes, and top with the LaCroix. Serve with a half-slice of grapefruit to garnish. Preheat oven to 350. Butter a 9 in cake pan, line bottom with parchment and butter parchment. Whisk flour with cornmeal, sugar, baking powder and salt. Whisk melted butter with eggs, zest and juice. Add butter to dry mixture in slow steady stream while whisking constantly. Scrape into pan and bake 40 minutes or until a skewer comes out clean. Let cool on a rack for 10 minutes, then remove from pan and invert on the rack, peel off parchment paper and carefully flip cake right side up. Let cool 30 minutes. Mix glaze ingredients until smooth. Pour glaze all over still warm cake and spread over top and sides. Let stand until set, 30 minutes. Store in airtight container for up to three days.